It’s surprising how little has been done in the US to address the massive amount of pollution and water waste that come from livestock breeding. In an innovative move, farmers in southern Taiwan have started to potty-train their pigs in response to a planned water pollution fee. 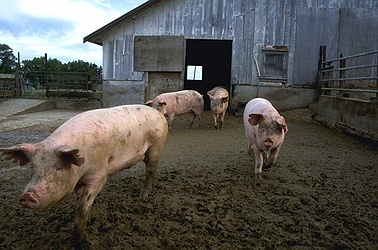 To keep their livestock from defecating into nearby rivers, a growing number of farms have established special “toilets” smeared with feces and urine to attract the pigs. The results have been encouraging. One farmer says that his pig toilet has helped him collect 95% of the waste and has made cleaning much easier. Are pigs in Taiwan that much smarter that US pigs?